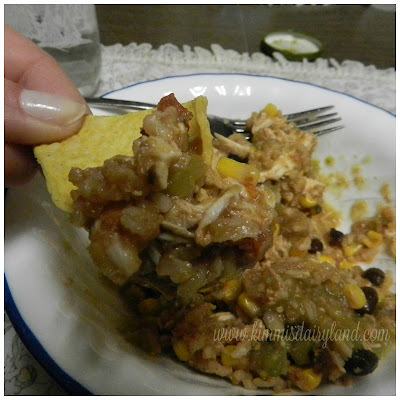 Looking for an easy and delicious Crock Pot recipe? Craving Mexican food? Then you'll love these Chicken Taco Bowls! Winter may be officially over, but I figured there's no better time than now to actually use my crock pot. Yes, I've had it for a year, and yes, it's been sitting on my counter for that entire time. I always have a plan to use it, but then I get busy and forget. It's Tuesday, so I figured it's the perfect day for tacos. In college, Taco Tuesday was always a reason to go out. Well, it had more to do with my work schedule than the tacos. Wednesday was my day off from working at the dairy and a morning I could sleep in before my 10 a.m. class. While most of my friends were going out to the bar or having fun on Friday and Saturday nights, I was usually in the milking parlor with the cows. The next morning I was feeding calves before the sun came up. On a farm, the animals take priority. It also means you can't always go out with friends or leave the farm for the weekend. I neglected my social life a lot for my dairy activities, but never on Tuesday nights. This recipe makes lots of leftovers, especially if you are only cooking for one or two people. You may want to stock up on containers for the leftovers!